We didn’t create another side-by-side. We created Havoc. Is it a work vehicle? A rec vehicle? Or something else entirely? Turns out, it’s all of the above. 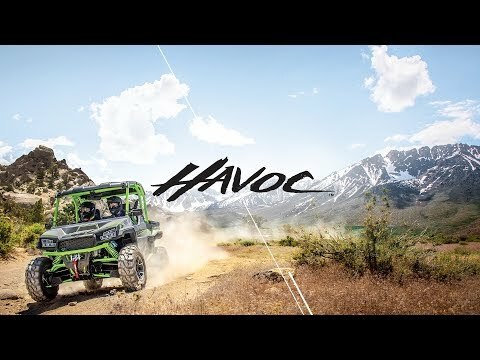 Our ruthless Havoc side-by-side features a class-leading suspension system, 100 HP and 2,000 pounds of towing capacity. It’s built with a work ethic and a sense of adventure — so you can create Havoc however you want. FOX 2.5 PODIUM QS3 SHOCKS WITH COMPRESSION ADJUSTMENT (HAVOC X): We equipped it with FOX 2.5 PODIUM QS3 Shocks that can take a beating, so you don’t have to. POWER: Precision-tuned 100 hp EFI engine, 67 ft. lb. of torque, forged internals, dry sump oil system, on-demand AWD. PRECISION-TUNED 100 HP EFI ENGINE: Big-time horsepower for any challenge that tries to get in your way. 67 FT. LB. OF TORQUE: Havoc gets out of the gate with huge acceleration. HAULING & STORAGE: Class-leading 2,000 lb. towing capacity, 600 lb. dump bed, 24 cu. ft. of storage, customizable 13.45 cu. ft. extended cab. 600 LB. DUMP BED: Pick up, drop off and repeat with a 600 lb. bed capacity. CUSTOMIZABLE EXTENDED CAB: Havoc includes 24 cu. ft. of storage and the most versatile cab in the industry. CLASS-LEADING 2,000 LB. 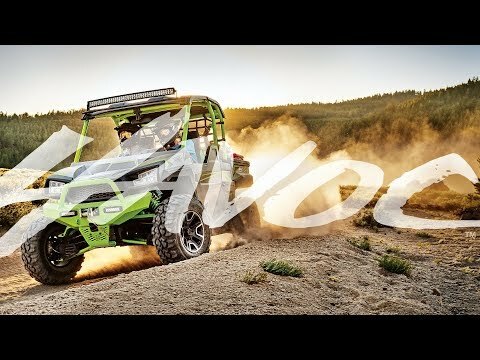 TOWING CAPACITY: If you’ve got a job to tackle, Havoc is ready for the long haul. DRIVER EXPERIENCE: Aggressive fascia, grille and fender flares; class-leading 5.25 x 3.25 in. LCD display; 10 sq. 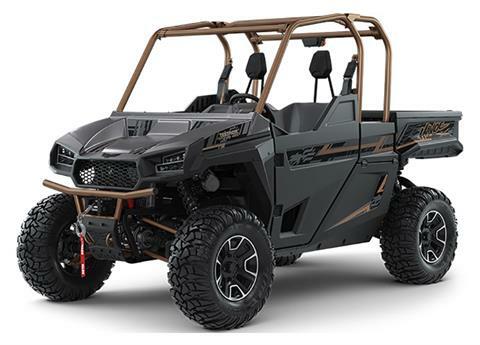 ft. opening for easy entry / exit; sport bolstered bench seat; standard high /low LED headlights & accent lights; standard impact-resistant full doors; standard brush guard. CLASS-LEADING 5.25 X 3.25 INCH LCD DISPLAY: Get customizable speed control and instant feedback on fuel level, engine temperature, RPM, gear position and vehicle diagnostics. STANDARD HIGH / LOW LED HEADLIGHTS AND LED ACCENT LIGHTS: Light up the road ahead when you’re up before the crack of dawn.